After vCloud Director 9.1 release in March we have new version 9.5 out! Here are links to release notes and a whitepaper describing its new features. Let me also go through the new features here so I can link additional blogs that will dive deeper into each one. The UI can now be customized with custom themes (at system level) with this css theme generator. Provider UI (accessible via /provider link) has been also enhanced, although the legacy Flex UI is still needed and system administrators will probably spent most time there. Both external and Org VDC networks (including vApp networks) can be assigned with IPv6 subnet. Note that you cannot use distributed Org VDC networks with IPv6 as NSX Logical Distributed Router supports only IPv4. More info here. In multi vCenter Server, single NSX domain architecture, it is now possible to create universal logical switches spanning multiple VDCs across VCs connected to universal distributed router with multiple egress Org VDC Edge Gateways. There is also a new concept of VDC groups to create (site) grouping. More info here. NSX-T is a new network virtualization platform that is in many aspects differs from NSX-V. NSX-T architecture is not tied with vCenter Servers, has different concept of routing – ESGs vs T0 and T1 routers and also uses Geneve instead of VXLAN as encapsulation protocol. Due to the huge differences between NSX-T and V, vCloud Director 9.5 currently only allows the import of existing logical switches as Org VDC networks and distributed firewalling (API only). Related to the above, it is now in vCloud Director possible to register vCenter Server without NSX-V associated manager (API only). User with Edit VM CPU and Memory reservation settings right can configure VM reservation, limit and shares in any Org VDC allocation model. Org VDC maximums (quotas) are still enforced. vCloud Director will also not override reservation configurations done at vCenter Server level. This is groundwork for future enhancement. It is no longer needed to prepare ESXi hosts to be used by vCloud Director. No agents nor custom attributes need to be installed or set. Provisioning or decommissioning of ESXi host is much simplified. Read more here. VM moves across VDCs (Move to … action) or clusters no longer use cloning method, but instead use more efficient relocate VC function. New role based access control with right bundles, global roles (published/delegated to one or more tenants). Also system admins imported from LDAP group can have a role assigned. 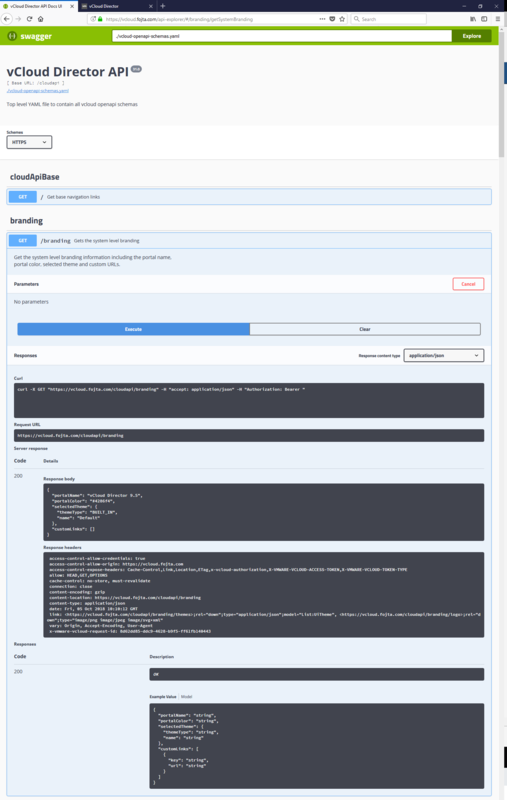 New /cloudapi APIs are now autodocumented with Swagger and can be viewed and executed directly from vCloud Director API Explorer web point at /api-explorer. Note that /cloudapi does not replace /api. 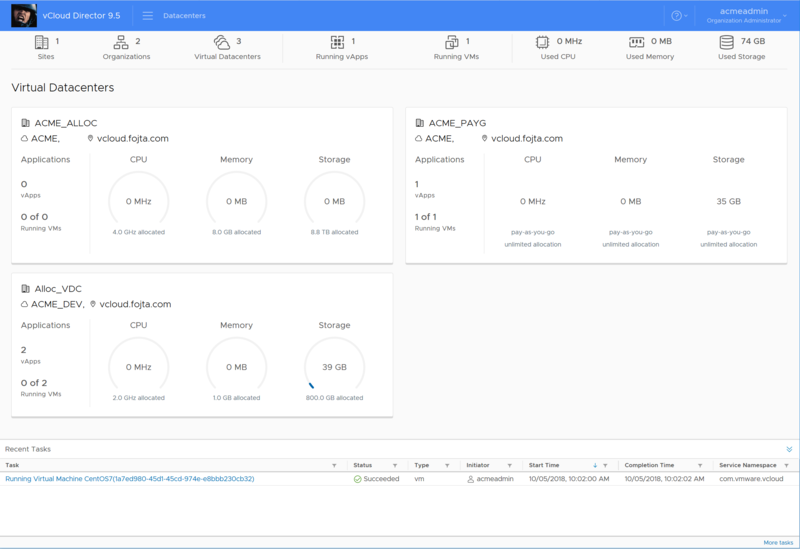 Those APIs are different and only some new features are available via the /cloudapi endpoint (H5 UI branding, vRealize Orchestrator services, UI plugins, etc.). Oracle database can no longer be used as vCloud Director database. MS SQL database is now announced as deprecated. The creation of legacy Edge Gateways is now in deprecated mode and will be removed in future releases. 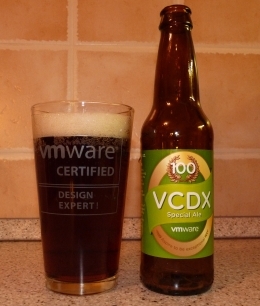 vCloud API version is now at 31.0. Some older ones were removed (notably 5.6, 9.0) so make sure your scripts are updated. As always check /api/versions for the supported and deprecated list. vCloud Director cell is now available as Photon appliance. This can simplify greenfield deployments, although NFS transfer share, RabbitMQ and vCloud databases (PostgreSQL or Cassandra) are not available in appliance format yet. You can still download vCloud Director binaries to be used in CentOS/RHEL VM as before. At the release day vSphere 6.0U3, 6.5U1/U2 and 6.7.0, NSX-V 6.3.5, 6.3.6, 6.4.0-6.4.3, NSX-T 2.2 are supported. Always check for updates here. VCD-CLI (CLI command tool to manage VCD both for tenants and sys admins) and pyvcloud (Python SDK) have been updated as well. vCloud Availability 2.0.1 and vCloud Availability for Cloud-to-Cloud DR 1.0 are not supported with vCloud Director 9.5. Both will require updates, which are coming soon. vCloud Installation ID change is now possible. Do you have the steps to change the branding logo using swagger? Mainly in regards to the string required in the body. Not sure how to reference the new logo file here. Any help would be greatly appreciated.